Program: Rhythm, Culture and the Number 5 — Part international drill team, part polycultural rhythm section, the Crosspulse Percussion Ensemble brings together synchronized movement, world drumming, lush vocals and innovative body music. 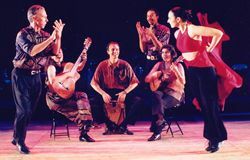 Each of the five ensemble members bring their own deep traditions to the floor, to mix and mingle, creating a unique intercultural experience! Weaving the oldest musical instrument, the human body, with instrumental webs of hand drums, bells, claves, gongs, trap set, banjo, voice and more — Crosspulse embodies a virtual world tour. 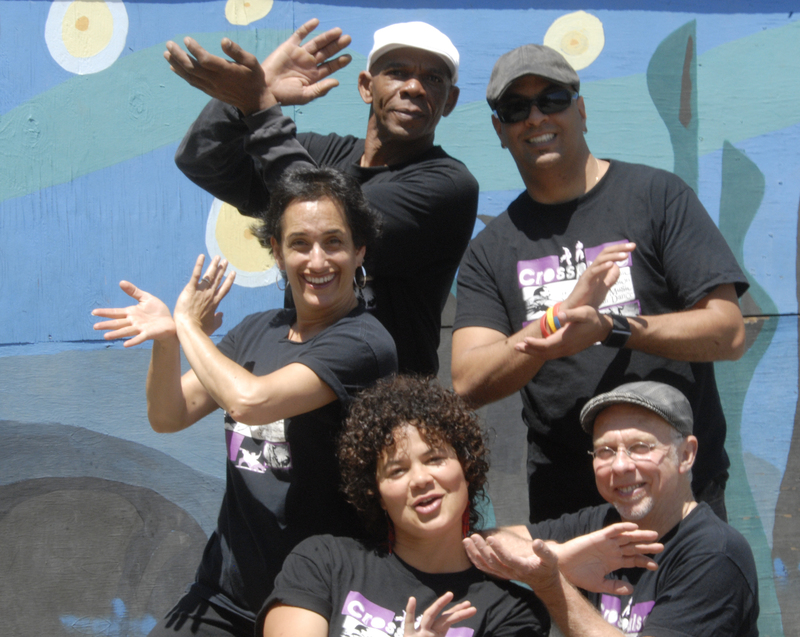 Keith Terry (Jazz, Body Music), Evie Ladin (Appalachian), Omar Ledezma (Afro-Venezuelan), Bryan Dyer (Beatbox) and Amber Hines (African-American Spiritual). Available for Assemblies, Workshops, Residencies and Family Dance Parties. Contact us for pricing and availability. 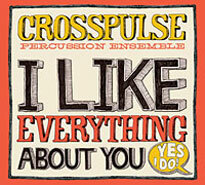 Crosspulse Percussion Ensemble was brought together by Keith Terry in 1992 in the San Francisco Bay Area. 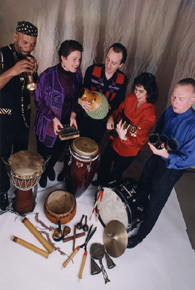 The ensemble brought together a multitude of influences – from body music, jazz, Afro-Cuban and West African drumming — to Balinese gamelan, South Indian solkatu, and the music of the Middle East, Japan and the Caribbean. 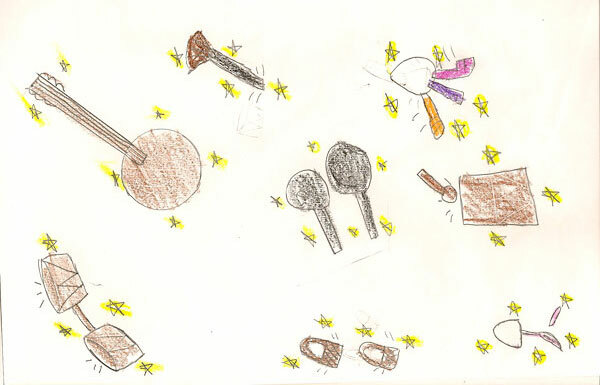 Loud, rowdy, athletic, playful, subtle, delicate and ethereal — their sounds and movement are fluently integrated, enabling us to see music and hear dance. 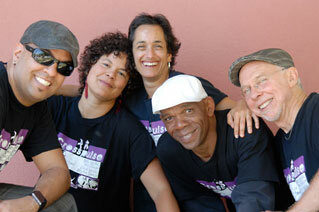 Crosspulse toured North and Central America, and Indonesia, in venues such as Lincoln Center in New York, Centro Cultural Costarricense Norteamericano in Costa Rica, San Francisco's Yerba Buena Center, UCLA Center for Performing Arts, The Arts Festival of Atlanta and the Indonesian Arts Festival in Bali. Crosspulse is a pool of players that has included Edgardo Cambón, Bryan Dyer, Raymond Graham, Claudia Gómez, Amber Hines, Namita Kapoor, Tacuma King, Evie Ladin, Omar Ledezma, Kelly Takunda Orphan, Susu Pampanin, Jackeline Rago, Amara Tabor-Smith, and Keith Terry. The ensemble has appeared in collaboration with numerous music and dance groups, including San Jose Taiko, the Ohio based Rhythm In Shoes dance company, Manhattan Tap, Linda Tillery and the Cultural Heritage Choir, and Gamelan Sekar Jaya. The band has recorded three albums: Keith Terry & Crosspulse, Serpentine and Body Tjak/The Celebration Soundtrack. Body Tjak/The Celebration is also available as a performance video. As of 2002, Crosspulse is on hiatus as an ongoing touring ensemble, but continues its educational programs and special projects. Children were enthralled, entertained and highly amused by the Crosspulse performers. No seconds were wasted, and the performers were enthusiastically cool and extremely energizing. Finally I found music I can dance to and snap my fingers to and sing to! It was marvelously good. Crosspulse is an excellent group!! All of the performers were so enthusiastic that it was very easy to get into the music. My students were completely engrossed in the performance the entire time. Their music is wonderful exposure to rhythm. This was one of the best performances I've seen!" Just wanted to let you know your assembly was a big success. The teachers review each assembly and you got all 5's (out of 5) and comments like 'my favorite assembly,' 'loved it,' 'must have them come back again.' So, thank you for a fabulous performance (making me look good).